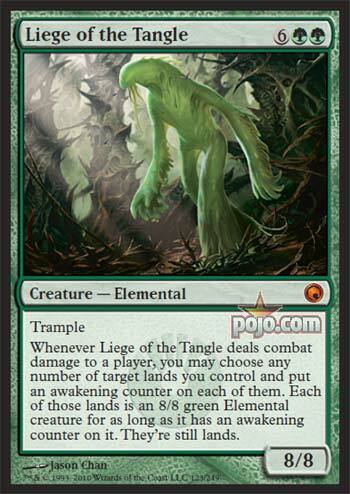 BMoor has a detailed Featured Article on the Liege of the Tangle with a couple of deck Ideas for you today. Click here to read it. Nature, someone once said, always finds a way, even on a world made of metal. Sometimes it finds a subtle way, like Acidic Slime or Naturalize disrupting with pinpoint accuracy. Sometimes it finds a very direct way, like Liege of the Tangle awakening a total of 64 power for the next turn's attack. For competitive purposes, people love their M11 Titans and Zendikar Sphinxes, but the Liege is still worth considering because it offers something none of those creatures can. Many creatures with this kind of cost and stats say "deal with me or lose." Liege of the Tangle goes one better: "deal with me, or deal with my throng of followers in a minute." Just watch out for Day of Judgment. Welcome back readers and today's card of the day is a new one from Scars of Mirrodin, Liege of The Tangle. For eight mana you get an 8/8 creature with Trample and the powerful ability to make your lands huge creatures. In standard Avenger of Zendikar and Primevil Titan rule the roost for expensive creatures for ramp style decks, a ramp deck playing enough land could make use of this card the only problem is it has to hit and has no evasion besides trample. In extended this card may see play in ramp decks or the highest curve of Elemental decks. In eternal no chance its an interesting card but severely outclassed. In casual and multiplayer this card can do some damage, personally I want it for my elder dragon highlander deck. This card can also fit great into elemental deck's or green ramp decks, which around the kitchen table can be devastating. In limited this is a huge bomb if your even splashing green you can make this work as it requires only two green mana to cast. Afterward it can turn all your lands into bombs. Overall an interesting card with definite casual and possible constructed applications, Scars of Mirrodin is is shaping up to be an amazing set for players. Today's Pojo Exclusive from the upcoming Scars of Mirrorin set is Liege of the Tangle which is an eight mana 8/8 with Trample that on the face may have a prohibitive cost, but offers a powerful effect. The ability to turn any number of your lands into 8/8 creatures without needing to give all of them a vulnerability to a Wrath of God styled effect is quite impressive even when attached to the combat damage condition. Having Trample allows the effect to be used reliably and if played in a Red/Green deck opens up the opportunity for Haste or extra attack phases to increase speed and dramatically lessen the window for an opponent to use removal. I can imagine the elemental lord Incandescent Soulstoke, in color Elvish Piper, or other options being used to bring this out very early even with the reduced number of available lands just to get in the surprise attacks. A bit of work would be required to get the most out of this mythic which may keep it more to the Casual decks, but I wouldn't be surprised at all to see some attempts at making it tournament viable. For Limited this is a huge bomb that will probably win any game in which it isn't immediately removed after hitting the battlefield. Being an 8/8 for eight mana is solid in the format and only two of that being Green allows almost any multicolor deck combination to reliably play it. Having Trample is a big benefit to get damage in over most blockers, but the option to turn some or all of your lands into additional 8/8 creatures is a game-changing move that few cards should be able to handle. With the possible exception of a Wrath of God effect or something yet unseen this is an absolute first pick and should never be passed to an opponent even if outside of your color. Even late into the draft it is generally worth adjusting your deck to include the Liege of the Tangle as it is just that powerful and splashable. For Sealed you would likely be playing more than one color anyway and Green is often best at filtering mana and acceleration which would allow this to be played earlier and stabilize the second or third colors chosen. Without seeing the rest of the set is may be a bit early to predict this as being one of the best cards in the format, but with low color dependence, high power and toughness, Trample, and a flexible single turn swarm mechanic this is just about everything you could ask for in Limited.